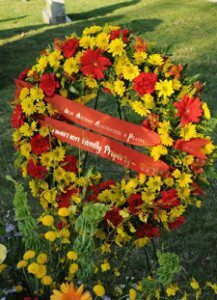 The family and friends of Col. John Walter Ripley said their final goodbyes during a moving funeral ceremony on November 7, 2008 at the U.S. Naval Academy in Annapolis, Maryland. He was laid to rest with full military honors in a ceremony that left most attendees either teary-eyed or speechless. Among the honorary pall bearers was Lt. Col. Le Ba Binh who fought with Col. Ripley in Vietnam and actually witnessed the destruction of the Dong Ha bridge; the 30th Commandant of the Marine Corps, General Carl E. Mundy; Lt. Gen. Sir Henry Beverly of the British Royal Marines, a long time friend of the deceased; and Congressional Medal of Honor recipient Col. Wesley Fox. 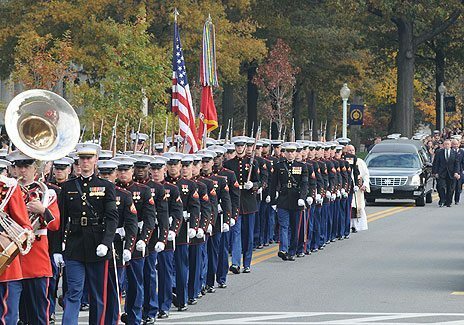 As the polished black hearse carrying the body of Col. Ripley approached the steps of the main chapel two Marine infantry platoons in dress blue uniforms with rifles and fixed bayonets snapped to attention. The seriousness of their demeanor was a clear indicator that they were just as capable of fighting a battle as they were of paying tribute to a war hero. Moments later, six more Marines, looking like they were carved out of marble, approached the hearse in a slow cadence and solemnly removed the casket. They then carried it up several flights of steps and gently placed it on the bier in the back of the chapel. The afternoon sun filtering through the stained glass windows illuminated the incense that wafted through the air, creating a blue haze that seemed to hover over the top of the flag-draped coffin. All of this created an ethereal ambiance that was truly unique. The people I met on the previous night at the wake made up part of the crowd who packed the chapel to say farewell. As I entered that blue haze, I saw a sea of 2500 mourners, many of whom were forced to stand for the entire mass. Row after row of academy midshipmen, dressed in formal attire filled the balconies above, while military officers, adorned with medals of gold and silver, sat in the pews below. As the coffin was brought forward, the Naval Academy choir intoned the mournful and soul stirring lines of the De Profundis; “Out of the depths I cry unto thee, O Lord.” The plaintive chant was originally composed as an appeal on the part of the disincarnate soul pleading for mercy before the throne of God. On this day, it produced an atmosphere of added grandeur considering the stature of the man whose funeral mass we were now witnessing. The funeral Mass. Colonel Ripley was a daily communicant. In his homily, Fr. Peter McGeory chose to bypass the stories of “Col. Ripley at the bridge.” He preferred to focus his words instead on the personal and religious side of the man. Col. Ripley was a Marine who went to mass on a daily basis when he was in town and did so with humility. “He was living proof that serving both God and country can be done with equal fidelity,” he said. His faithfulness to his wife Moline, who was diagnosed with Alzheimer’s, was equally intense. Moline was an archetypal Southern lady who had been reduced to a wheel chair because of her illness. Father McGeory told of witnessing Col. Ripley at an Academy event one day kneeling on one knee next to his wife’s chair, gently speaking to Moline as he spoon fed her. Seeing his wife reduced to such a state caused Col. Ripley more suffering and required more strength of will than his superhuman efforts in the destruction of the Dong Ha Bridge. It would be one of the last bitter gulps from his chalice of suffering. Academy midshipmen leaned with elbows against the pew in front of them soaking in every word as Captain Ripley finished with an anecdote that illustrated the loyalty of his father. In 1985, Col. Ripley lost a good friend when the commandant of the Naval Academy, Leslie Palmer died. When Col. Ripley went to pay his final respects to his friend, he was shocked to find there was no honor guard. He remedied the situation with a sacrifice that was as noble as it was arduous. The Commandant of the Marine Corps, General James Conway began his eulogy with a reference to the long history of the Marine Corps and legends such as Joe Foss and Chesty Puller. “John was direct,” he said, “and you didn’t need to ask him something if you couldn’t stand the answer.” A good example of this was the heroic and politically incorrect testimony Col. Ripley gave against women in the military in June of 1992. At the conclusion of the funeral mass, the 2500 mourners followed behind the coffin as the body of Col. Ripley made one last trip across the academy grounds to the cemetery a mile away. The Marine Corps band, playing a drum beat, and two infantry platoons led the way followed by the hearse, the immediate family and friends. As the coffin was put into place over its final resting place, the sorrowful crowd looked over their shoulders at what sounded like a plane taking off from a nearby airport. As the sound grew louder, four AV-B Harriers in a missing man formation flew directly over the flagged-draped-coffin. While the audience experienced a prideful chill, Captain Ripley choked back tears of gratitude for the enormous tribute on behalf of the United States Marines. He was unaware that his father would receive such an honor and explained for me the deeper meaning behind the gesture. Col. Ripley’s older brother Mike was a fighter pilot who flew three, thirteen-month missions in Vietnam and was considered by many to be the most tested pilot of the time. When he returned to the United States in 1971 he was asked by the Marine Corps to test fly the Harrier and was killed on one of the first runs when his plane crashed into the Chesapeake Bay. He left such a mark on the Marine Corps however that the top marine test pilot in the United States every year is presented the Mike Ripley Award in honor of him. It was one of the many symbolically beautiful gestures witnessed during the day: one Ripley hero honoring another. As the band played the Marine Corps hymn off in the distance, there was another symbolic gesture. In every other branch of the armed forces there are eight body bearers, who carry the coffin of the deceased. The Marines pride themselves in using only six. 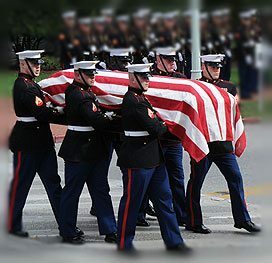 Unlike the others branches who carry the coffin at waist level, Marines carry their dead at chest level. After the fly over of the Harriers, we witnessed one more thing that makes a Marine burial unique. 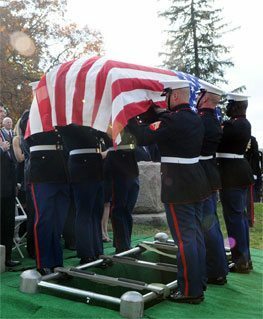 In a display of extraordinary strength, the six Marine Body Bearers raised the coffin of Col. Ripley to chin level as a symbol of the final respects being paid to a fellow Marine. After lowering the coffin, the body bearers slowly grasped the American flag and pulled it taut over the top of the coffin while Father McGeory said the final prayers for the soul of Col. Ripley and sprinkled the coffin with Holy Water. The grave-like silence which had descended upon the audience was briefly interrupted by the traditional gun salute. The three volleys, during wartime, were a sign that the casualties were taken care of and the fighting could resume. The painfully sad conclusion to the burial was the moment when the six Marines ceremoniously folded the American flag and presented it to Col. Ripley’s only daughter Mary: yet another symbolic gesture of thanks on behalf of a grateful nation. At the conclusion of the ceremony, everyone was invited to a reception yet few wanted to leave. Many chose to remain close to the polished cherrywood coffin. A number of Marines took the opportunity to give a final salute. Some kissed the eagle embedded in the top while others exhibited an almost inconsolable emotion. Colonel Binh approached the bier and placed both hands on the coffin, as if seeking one final support from the man who fought so hard for his people. 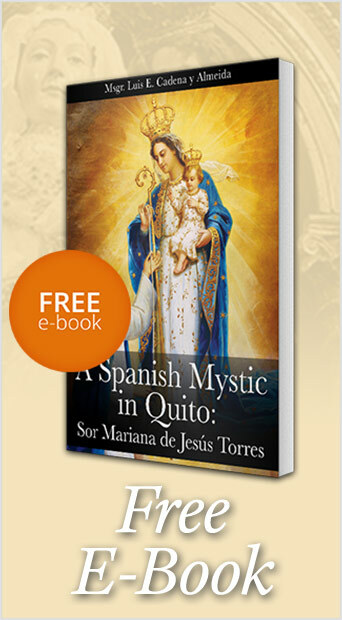 Overcome by grief, he mechanically fell to his knees, embraced the casket and wept profusely. I later had the chance to speak to Col. Binh. “You are no doubt moved by the remembrance of what Col. Ripley did for your country,” I asked. Being a man of few words, he simply nodded his head in mournful recognition as his eyes welled up with tears. Before leaving the burial, I recognized a Marine who had been at the wake the night before as I sat alone in the chapel praying for the soul of Col. Ripley. I never tire of seeing the way American soldiers do the smallest things in the grandest way. 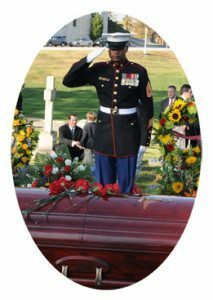 This Marine entered that night, drew near the casket, removed his hat and bowed his head in prayer. He then replaced his hat squarely on his head, stood bolt upright and executed a solemn salute. After an about face, he departed the room in a decisive military fashion. Col. Ripley would have been proud of him. We spoke for a moment beside the grave and he seemed to have a need to share his feelings about the man to whom we were now saying our final goodbye. His demeanor was strikingly humble yet his upright posture and the glow of admiration in his eyes seemed to indicate a firm determination to follow in the footsteps of this great man. He was not alone. I saw the exact same look on the face of Naval Academy students who attentively followed every eulogy given for a man who is truly an American legend. While we all mourn the passing of such a legend we are consoled by the thought that his example will inspire generations to come. Our sincere and heartfelt condolences go out to the family of Col. John Ripley. This entry was posted in Catholic Perspective, Events of 2008, News Commentary and tagged America, Annapolis, Catholic, character, colonel, combat, congressional, country, Dong Ha, duty, example, Farewell to a Legend, freedom, Funeral, God, hero, honor, John Walter Ripley, legend, Marine, medal, military, Naval Academy, Royal, symbol, testimony, Vietnam, War, women by Norman Fulkerson. Bookmark the permalink.